This time I was faced with two birthdays at once. Rich wanted Coconut Cream Pie, while Joanna requested Magnolia Bakery’s famous banana pudding in pie form. 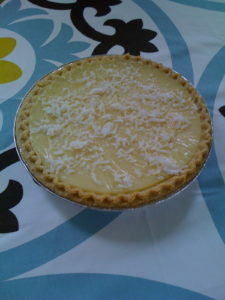 I got the coconut cream pie recipe from Betty Crocker. I found the Magnolia banana pudding recipe on line. The result was delicious but a bit too mushy for a pie. In the bowl of an electric mixer, on medium speed, beat together the condensed milk and water until well combined, about 1 minute. Add the pudding mix and beat well, about 2 minutes. Cover and refrigerate for 3-4 hours or overnight. In a large bowl of an electric mixer, on medium speed, whip the heavy cream until stiff peaks form. Gently fold the pudding mixture into the whipped cream until well blended and no streaks of pudding remain. Layer the bottom of the pie crust with a ¼ of the sliced bananas. Cover with a thick layer of the pudding. Arrange a layer of whole wafers or wafer crumbs over the pudding. Cover with another layer of sliced bananas. I made this cake about a month ago when I had some friends over to watch another True Blood marathon. It has no connection with the show whatsoever. I just happened to have applesauce in my fridge, and it seemed like a delicious idea. Preheat oven to 350 degrees. Butter and flour a 9″ springform pan. Combine the flour, baking soda, and salt in a small bowl. Remove saucepan from heat, and stir in the granulated sugar, applesauce, diced apple, cinnamon, ginger, nutmeg, vanilla, and eggs. Add the flour mixture, stirring until combined. Bake about 35 to 40 minutes, or until a toothpick inserted comes out clean. Put pan on wire rack to cool for about 10 minutes. Loosen the sides of the cake from the pan with a knife. Invert onto the rack. Turn it over again onto a serving plate. 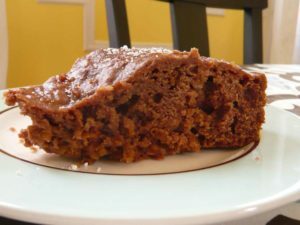 Sprinkle cooled cake with confectioners’ sugar.